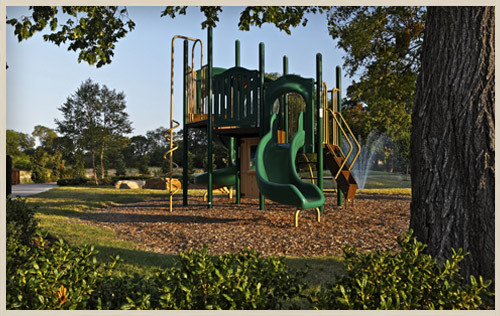 Parks are one of the most popular amenities in any Southern Land Company Community. And, these open spaces always enhance what is already there: nature. Tucker Hill’s commitment to nature simply builds upon what came before. We’re just adding more greenery, flowers, parks, gardens, and trails. We promise that everything that can be preserved will be preserved. From the moment you enter Tucker Hill, you’ll enjoy mature trees – a rare and coveted commodity in North Texas. In addition, you’ll find a commitment to planting even more “legacy” trees (native to Texas) that will eventually form shade canopies over many of our boulevards. Throughout Tucker Hill, you’ll find a toddler and kid-sized playground, ponds, creeks, and acres of natural open space surrounding the community. Several parks (including one for dogs and two that feature their own fire pits) offer more green space to enjoy. Founders Square is our central gathering space and features one of the largest, privately-owned fountains in the United States. The Lawn Chair Amphitheater plays host to fun outdoor concerts. And, as Tucker Hill nears completion, watch for a paved hike/bike trail built in conjunction with the City of McKinney’s master plan. To this end, our community designers work to include a neighborhood “green” center within a 5 to 10-minute walk from each home. These open spaces serve as the main gathering areas for our master-planned community. They promote the health and well-being of residents. And, they bring people together for recreation and relaxation.